Ooooooo....look at all the pretty flowers! The Cardinal Greenway Wildflower Photographs digital collection provides online access to 146 photographs of wildflowers taken by Diane E. Hill along the Cardinal Greenway between 1999 and 2005. Slides were produced from the original photographs between 1999 and 2008. 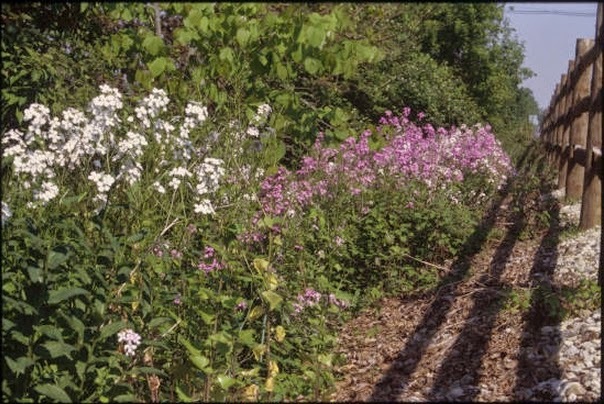 Research to identify the wildflowers was conducted by Stanley P. Hodge in April 2006. Incorporated in 1993, Cardinal Greenways, Inc. is a private, not-for-profit organization that encompasses the Cardinal Greenway, White River Greenway, Historic Wysor Street Depot, and Cardinal Equestrian Trail. In 1993, Cardinal Greenway, Inc. acquired sixty miles of abandoned railroad as part of a Rails-to-Trails program. The Cardinal Greenway is the longest rail-trail in Indiana and spans 62 miles from Marion through Muncie to Richmond, Indiana.